Push us with your radical rhythms there, Scooter! Scooter themselves have denounced this single; heck, they actually never play anything from the album from which it stems, 2000's "Sheffield", during their tours. The fans like the album, but Scooter have claimed that they felt it was just a muddling of ideas with no real direction. And they also seem to dislike "I'm Your Pusher" because the lyrics sound childish -- something apparently no other Scooter song seems to have this same problem. 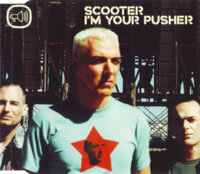 No matter what, however, "I'm Your Pusher" has all the elements that makes a solid Scooter song. The Radio Edit gives us everything we need for a good time: the screaming crowd, frontman H.P. Baxxter giving us shouts to repeat ("Yo-yo-yo! ", "Yeah! Yeah! Yeah! ", and the like), and a strange squeaky sound in the background that, surprisingly, works well in providing a little audio pressure. However, the chorus is quite the opposite of what you'd expect: it's instead a take on "Flieger, Grüß' Mir Die Sonne" from a 1932 German film entitled "F.P.1 antwortet nicht". That means relatively little to most people, but it certainly means they reached really far back in time for this one (or maybe they just heard the cover version from a band called Extrabreit in the 1980s). The bagpipe-style marching anthem is certainly a novel aspect, though it wouldn't work well in a club setting. The single also features an Extended version, which includes a manic announcer introducing Scooter, but very little else new. The Pusher 2, the first of two B-Sides, mashes together some of the instrumentation from "I'm Your Pusher" to try and form a unique track, including the aforementioned squeaky synth and other, more straightforward dance parts. This one might actually be more club-friendly, as it lacks any elements of a marching tune. And last but not least, there's Firth Of Forth, which bears no resemblance to any of the previous tracks. It's quite dark, focusing more on somber pads and other synths to create a moody atmosphere, rather than providing hard beats with which the masses can party. Another side of Scooter we probably should see more of (but we don't). There isn't a strong melody here, but its subtlety aids in its effectiveness. To be honest, I really didn't like this track at all for about ten years, but suddenly, it has clicked with me.